Many people without obvious eye problems never bother to get an eye exam, and years can pass before they actually visit an eye doctor. However, this neglect could be to their detriment, as a delay in having an eye exam could lead to a late discovery of a serious eye condition. Dr. Tyler Amos and his staff at Cove Eye Care advise everyone to get a comprehensive dilated eye exam every year even if they are experiencing no vision problems. His office is located in Hampton Cove and he serves people in the surrounding areas of Huntsville, Owens Crossroads, New Hope, Gurley, Scottsboro, and Guntersville. The Center for Disease Control and prevention (CDC) says that vision maladies become more prevalent as we grow older and tend to affect certain groups such as those with chronic systemic diseases much more. Not withstanding that eye problems like Glaucoma, Cataracts, Macular Degeneration, Diabetic retinopathy, and High blood pressure related retinopathy can result in blurred vision or even blindness, there are eye problems including the above mentioned that can be corrected or given a much better prognosis with the use of modern technology or if they are identified early. 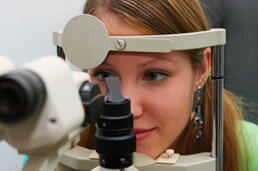 There are also a host of things people can do naturally to prevent damage to their eyes or promote good eyesight. One of the most important is wearing quality sunglasses to sufficiently block Ultraviolet (UV) sun rays. Another is practicing a healthy lifestyle and diet to promote good cardiovascular health and an appropriate weight to avoid diabetes. It is also beneficial for some to supplement the diet with certain vitamins and nutrients in many cases. Avoiding smoking is not only crucial for your overall systemic health but also specifically for your eyes. Dr. Amos recommends an annual dilated eye exam regardless even if you have perfect vision as the best method of protecting and preserving that vision. A variety of serious eye diseases such as the ones listed above have no obvious signs or even symptoms in their beginning or even moderate stages. Therefore it is crucial to have a regular exam in order to catch them early before the damage is able to reach a serious level. If you haven't had an eye exam in years or if it is just time for your annual check up, schedule a visit to Dr. Tyler Amos at Cove Eye Care, your Huntsville eye care specialist.